As Marcel Proust said, "The only real voyage of discovery consists not in seeking new landscapes, but in having new eyes." Nine Gates Mystery School is a program of self discovery. Discovery of who you are and why you are here; discovery of your energetic connections with Earth and Cosmos; and then, if you so choose (and many do), discovery of what you might feel moved to do about it. No one opens your eyes to these things for you. Rather, Mystery School opens and holds the safe space for you to discover on your own, at whatever pace and to whatever degree you want, need, and dare to go. It is (or can be) a very empowering, and hence fear-reducing, experience. 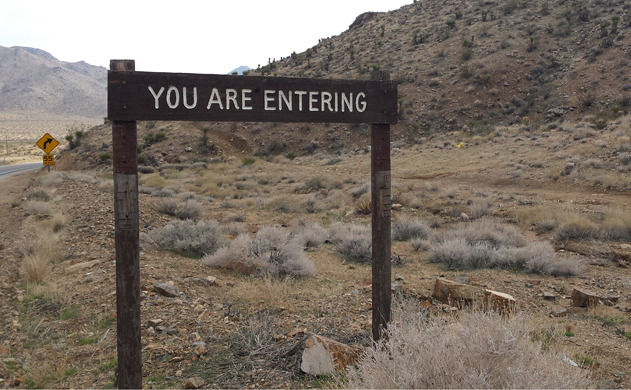 Entering what?, you might ask. Why, entering the mystery, of course! This sign, by the way, really does stand by the side of the road on California State Route 247 as you head south across the Mojave Desert from Barstow to Lucerne Valley, where Part I of Mystery School takes place. How do you see this school impacting your life. Good question, Mike! For many people, it makes a dramatic impact, empowering them to make decisions that alter the course of their careers, relationships, etc. For others, like me, it's more subtle. In my case, it reaffirmed a path I was already on, and gave me the self-awareness and reassurance that I was going in the right direction for me, and energize my self-confidence and motivation to proceed accordingly. It's hard to articulate, but that path for me is one of greater understanding and felt sense in the body of the fundamental oneness of all things and how to live that in my daily life, in what I do every day, in how I relate to those around me and to Earth as a whole. I am now conscious of what I think I have always felt/known unconsciously - that is, that the unity of all as the essence of nature is also the essence of peace, and that that has all along (before unconsciously, now consciously) been the driver of my dedication to doing what I can -- in subtle, inner work as well as in more active outer work -- to bring about a cultural shift in our society to a culture of peace. That manifests currently in my work both with the National Peace Academy and with Nine Gates Mystery School itself.